Can the old reliable spark plug be replaced? 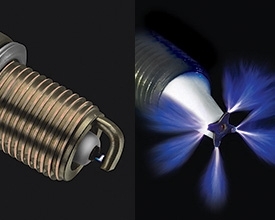 An illustration shows a spark from an Advanced Corona Ignition System plug igniting fuel. DETROIT -- Researchers at Federal-Mogul Corp. are developing a new type of spark plug that sends a web of plasma bolts into cylinders to ignite fuel. Plasma, a collection of charged particles, is generated by electricity exciting air near the tip of the plug. The company says at least 10 automakers are evaluating the high-voltage device, called Advanced Corona Ignition System. Engineers believe the ignition system will enable changes to engines that can improve fuel economy, lower emissions and boost engine performance. Federal-Mogul, one of several companies working on new-generation spark plugs, says the ignition system could be installed in some engines by 2017. But an ignition system engineer for a Detroit automaker who has studied the Federal-Mogul system said many technical and cost issues must be overcome before it can be adopted. He declined to be identified. Spark plugs in today's cars look and work the same way they did 100 years ago. They have a center and ground electrode in a steel case with a ceramic insulator. The spark jumps between the two electrodes to ignite the air and fuel mixture in each cylinder. The length and strength of the spark do not vary. The spark from a traditional plug is usually around 0.042 of an inch, or about the width of a business card. 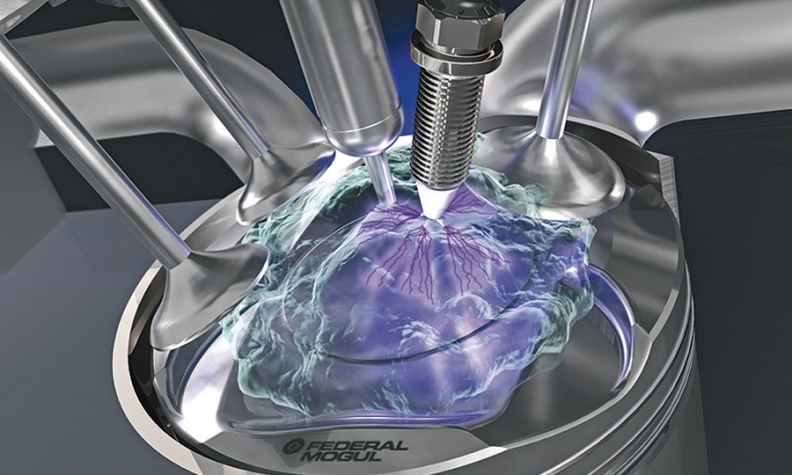 During a recent demonstration of the system at Federal-Mogul's tech center here, an Advanced Corona Ignition System plug in a lab emitted plasma bolts from the tip. Kris Mixell, director of ACIS for Federal-Mogul, described the problem with modern engines this way: "As you add more exhaust gas or reduce the amount of fuel, the mixture becomes very, very difficult to ignite. But you only have the same amount of time for that to happen. The multiple arcs from the ACIS plug overcome that." At left, the tip of a traditional spark plug contrasts with that of one of the advanced plugs, right. Also, as engine sizes continue to shrink, the diameter of the threaded part of spark plugs is getting smaller, going from 14 millimeters wide to 12 millimeters. The smaller diameter size puts extra stress on the ceramic center of the plug, where heat builds up, said Rich Keller, Federal-Mogul's director of ignition products engineering. By changing the shape of the new plug's tip and tuning the electronics, engineers can vary the timing, duration and length of the plasma arcs. That variability, along with changes in the engine's intake and combustion components, could boost fuel economy up to 10 percent in some engines, according to Federal-Mogul. The new plug is not affected by heat or size, Mixell said. It also fits in the same space as a traditional spark plug, he added. The ignition engineer for the automaker, which is testing the new-generation plug, said the device has the potential to deliver major fuel economy gains in some engines -- but only if the intake and other systems are modified. And then there's the cost issue. Regular spark plugs are a commodity item with dozens of suppliers, such as Denso, Bosch and NGK, cranking them out by the millions. "We've been squeezing every penny out of the traditional ignition system for the last 75 years," the engineer said. "We have a lot of experience with it. We know where it is weak, and we know where it is strong. Departing from a reliable, affordable known base for something that is significantly different brings with it some risks." And, unlike a regular spark plug, the Advanced Corona Ignition System requires its own dedicated computer and electronics, adding further cost and complexity. Mixell contends that the system would not require major engine redesign and that the components used in the device such as the steel case and ceramic insulators, are proven. "We don't want engine designers redesigning their engine around an ignition system. All these materials are proven. We know they work. We know they are durable. And we can manufacture them."